My name’s Alberto Gomez. I’m a freelance illustrator and story artist based in Madrid. Actually, my first job was at a small animation studio. I was 18. Years later, I had a gap of a few months outside any artistic job. I worked at the airport in Madrid, at the sales desk of an airline. I sold tickets, changed reservations and dealt with flight cancellations. That was when I found out that I could tame big groups of raging people with my bare hands. My favorite project is always the one I’m working on right now. But I’d say that I learned more from the failed ones rather than the successful ones. My name is Nikolay Moustakov. I am a freelance Story Artist and Animation Director. I’m also developing animation projects through my company Earthly Delights Films. Storyboarding on the feature Fantastic Mr. Fox, directing the TV series Sergeant Stripes for CBBC and my own short films. My name is Kat Miranda and I’m a freelance story artist/illustrator. While interning at Titmouse in Manhattan, I’ve had the pleasure to work on Venture Bros Season 5! GO TEAM VENTURE! Also a tad on Metal, a tad on Super Jail and a tad on Motor City helping with little things over all! 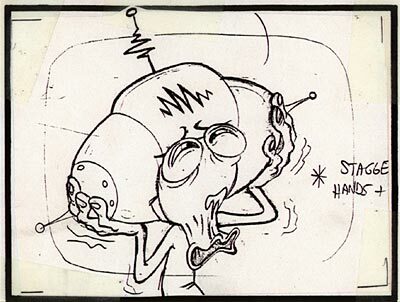 Animation Resources.org has a fantastic Ren and Stimpy board up and if you’ve never visited Animation Resources and you’re into animation, you’re in for a huge treat because it’s one of the unsung jewels of the internet. Check it out! By Mike August 9, 2016 August 9, 2016 Promote Yourself! Might as well use this site for my own promoting as well huh?